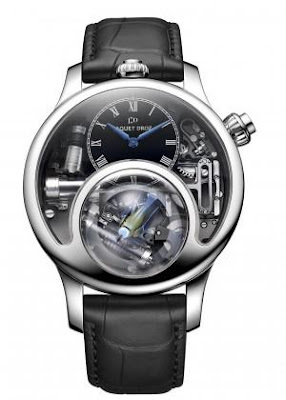 Jaquet Droz's Charming Bird watch could be too cute. It could be too complicated. It could be too energetic. Instead, it is too beautiful. The bird sings! There's a small piston tube inside the watch that moves in and out of a shaft to make the birdsong. The Charming Bird is the nexus of art and automation, of design and engineering, of beauty and fun. The Charming Bird costs $500,000 dollars. to take a look. Photo from Jaquet Droz.